DESIGUAL’s Spring 2017 collection paid homage to the ‘Global Traveler’ whose unique reality lies between the urban and virtual jungles. This bold, female pioneer is defined by her fearless attitude, conveyed in her bold individual and creative style. 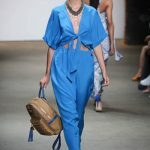 The brand looks to dress its free-spirited muse in looks that are comfortable while accentuating her femininity. Flattering silhouettes in distinct fabric combinations using animal, botanical and ethnic prints were enhanced with crystals and hand-sewn embroidery. The beauty direction was inspired by social media, adopting fun “filters” as a means of artistic expression in a virtual world. Notable guests included Miss Universe Pia Wurtzbach, Miss USA Deshauna Barber, Miss Teen USAKamie Crawford, internationally celebrated actresses Paz Vega and Tea Falco, model Kelly Bensimon, TV personalities Andi Dorfman (The Bachelor), Caila Quinn & Sharleen Joynt (Bachelor in Paradise), fashion photographer Nigel Barker, Olympian fencer Miles Chamley-Watson, bloggerHelena Bordon, actresses Fatima Ptacek, Tashiana Washington and Clare Foley, actor Eric West,singers SYMON and Kristine Elezaj, and models Jessica Minh Anh and Yovanna Ventura.